Wait, you did what? Bob and I floated a stretch of stream I knew to be a canoe route. An unforgivable sin? Stupidity? When I arrived at the meeting place a couple minutes after 8 on Saturday. We were in the middle of a torrential downpour. When we got to the take out to place a vehicle, a feeder was dumping mud into the creek. Two things, first, we could try to fish in between the feeders to find clearer water. Second, a rainy day would surely deter canoers, so this opened up more stretches to us. Right? Right? WRONG. At the new put in, the canoers piled up. I forgot my tackle backpack, so had to make due with some spare hardbaits and a buzzbait from my trunk. Always carry spares in your trunk people, for just such an emergency. I was without forceps and terminal gear, but at leat I could fish. We headed upstream for a short wade above the bridge. 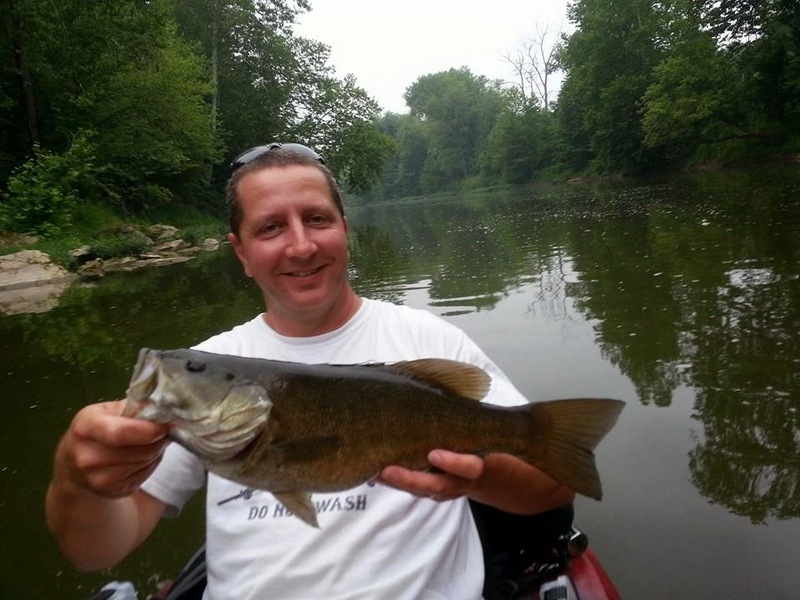 Upstream, dragging our kayaks behind, Bob lagged behind as I topwatered a few quick fish (15") on a Sammy 100. We dragged and waded upstream a long way through shallow stuff. Picked a fish here and there. Bob fluked a nice 16" and I knew something was up, topwater bite off? We just couldn't see the holes that well after the rain. A brown stain. I had a fish eat a still Sammy right in front of my and another pop a gunfish off a boulder. Flukes mostly.But then the clouds came out! Now we turned around and got in our kayaks. I would show Bob the benefit of fishing a buzzbait in a kayak. Easy. Drift downstream, rip it loud and don't stop casting. The more casts, the more fish. I quickly had 5, including a 15". Couple more nice ones then a 16.5" right behind Bob's boat. My counter rotating buzz was louder than his single blade and was paying off. Canoers, so many canoers. The buzzbait bite was insane for me until we ran into them. We tried to wait them out, but they kept coming. We helped a couple right their canoe and ate lunch. The promise of an insane buzzbait bite was ruined by people! I was wrong. The bad weather hadn't deterred the masses. At all. We were passed by three fly fishermen in canoes. Later I caught up, while they fished an eddy on one side, I floated down midstream and launched a long cast to the complete opposite side, sheltered by some wood cover where I surmised the SMB might have been pushed to by canoe noise. True enough, working the bait parallel to the bank not far from shore,I was rewarded with a hefty 17". I imagined dirty looks from the fly guys, tough. We were on the water first, and I had kindly avoided where they were fishing.. In four more casts I caught 4 more smallies, after a couple they got up and left. I felt bad for them because all the ruckus caused by the canoers was going to make their creeping style fishing difficult. We finally hit the best spot and a half hour after we saw the last person. Bob nails this really nice fish on a buzzbait, then a 16" on River2Sea wake bait. Was a great day. Here's Bob's pig just under 19". Some tubers had been taking their time behind us. A heavy drunk woman got close enough to ask how far from the bridge we were. She said their three year old was cold. It made us both feel bad, but also a little angry that you'd bring a three year old out tubing a 5 mile+ trip, on a rainy day, and that you'd guzzle beer the whole way. It was only a mile, but it looked like a storm. neither Bob or I had the room to carry 4 drunk people and a child. It poured hail and holy hell after that. I mean, holy hell. I was getting mad at myself for not knowing what to do. Even more mad at the stupidity of people and my poor choice in taking Bob on this stretch this time of year. Feel like we should have tried another stretch, Bob nailing that good one was excellent. Lesson learned on what could have been a better day if not for the constant interruptions and spooked fish behaving unnaturally. My new Commander 120 was a joy to fish out of once again. Next time out, I'm taking the seat out and standing. Promise. John, the counter rotators can be made to "nick" each other and create one hell of a racket. It's what I always use. I rip buzzbaits. We don't have a lot of deep water either.